Moved in early?! Head to your Muir House Lounge to meet your House Advisor’s and fellow housemates! Apartment residents, meet your HA’s in the Quad. Mandatory for Muir Residents. Meet the Outreach team and learn secrets for a successful first week of college. Trust in me, you won’t want to missss Dr. Ken’s Hypnotissst Ssshow. In the event of rain, this will be hosted in Ledden Auditorium. Arrive early for a good spot. Enjoy lunch with your fellow commuters and learn about commuter life! RSVP by 9/21 at 12:00pm to: muirsaintern@ucsd.edu. Muir Students Only. Magic mirror on the wall, which org will you choose this fall? Student leaders, sweet treats, raffles, and games await you! All Muir College Student Organizations will be tabling. The 1st practice for the UnOlympics dance & games! Let’s win the Golden Shoe! Head to your Muir House Lounge to meet your House Advisor’s and fellow housemates! Apartment residents, meet your HA’s in the Quad. Mandatory for Muir Residents. Registration: Sunday, noon-10:30, or until event capacity is reached. Located at the Marshall Tennis Courts. Event Description: Fall Y'all kicks off the school year with a free music festival that welcomes new and returning UC San Diego students. Hosted by the undergraduate student government, Fall Y’all features a stage musical performances, free food from unique San Diego vendors and other interactive elements. Our festival captures the excitement of students in their first moments of the new school year. Welcome to fall, y’all! Indoor fireworks, entertainment, food, and fun! Meet in the Quad at 10:30AM to go with fellow Muirons. Check out campus-wide student services that are you ticket to success in college! Practice makes perfect – don’t miss out! First-Year Muir Students Only: Kick off your academic journey at UC San Diego with a welcome from our esteemed faculty! Chat with faculty members over dinner. Dinner provided. Enjoy a night of music and dancing at Muir College’s Welcome Week Dance. Reputation for best Welcome Week dance! Oh no, Dalmatian puppies are hiding in major “spots” on campus. Rescue them with a group before Cruella finds them. Treats for all participants. Prizes available for the first groups to complete it. Hone in those dance moves or volunteer for a relay race. Don’t miss out on s’more, games, and friendship. Whether you forgot something at home or just want to take the first of many trips to the $1 bins, join us for a trip to Target in Mira Mesa and stock up on items that you need!. Eat delicious organic pancakes with Muir Environmental Corps (MEC). Sustainability reminder: bring your own reusable plate AND utensils! *Best UC San Diego Tradition* Come participate and cheer on Muir as we battle for the Golden Shoe! Unwind and grub with the student government of Muir College. Interested in joining? Ask about open applications. Come out to karaoke night! 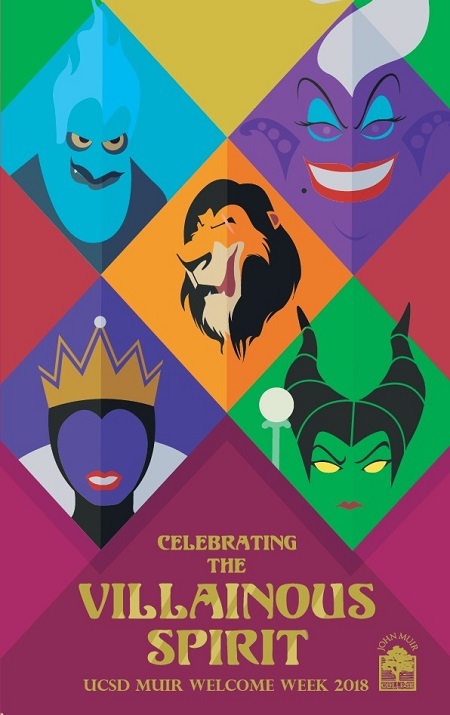 Get your vocal cords ready to sing your favorite hits (or Disney villain tunes)! All skill levels and ranges welcome. All incoming UCSD transfer students are invited to the Transfer Welcome – a social designed to help you meet other incoming transfers. Enjoy snacks; enter to win prizes; and learn about special events, opportunities, and groups that are designed for you. This event is open to all Colleges, but is limited to incoming transfer students only. Laugh away the first day of classes with a fun night of comedy with Muir’s improve student organization, FOOSH! For more information about events happening throughout the year, please read Muir Words, the college’s weekly newsletter, like us on Facebook, and follow us on Instagram @muircollegeofficial. April 13th - Triton Day! May 1st - Deadline to Accept your Offer of Admission.